It was an unfortunate coincidence that on the day the British Social Attitudes survey was released which announced that more than half (53%) of the British public now describe themselves as having “no religion” (and the share of the population who say they are CofE has fallen to just 15%), Justin Welby was preaching from the Financial Times pulpit about Britain’s economy being “broken and unequal”. 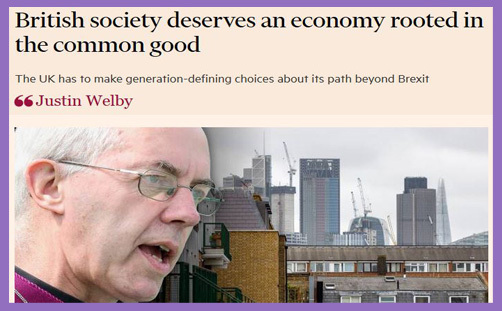 And so we had a series of regrettable juxtapositions: the Telegraph‘s ‘British capitalism is ‘broken’ because it leaves young people behind, says Archbishop of Canterbury‘ set against ‘Britain has more non-believers than ever before as Church of England Christians make up lowest-ever share‘; and the Guardian‘s ‘UK’s economic model is broken, says Archbishop of Canterbury‘ set against ‘More than half UK population has no religion, finds survey‘; and the BBC’s ‘Archbishop of Canterbury calls for radical economic reform‘ set against ‘More than half in UK are non-religious, suggests survey‘; and the Daily Mail‘s ‘Fury as Welby says economy is ‘broken and unequal‘ set against ‘Britain loses its religion: Number of people who describe themselves as atheists is at its highest EVER level‘. Has Welby gone wobbly, too? Was he ever strong and stable? Britain stands at a moment of significant economic uncertainty; a watershed moment where we need to make fundamental choices about the sort of economy we need for the way we want to live. I am convinced that most people in Britain want the same things from the economy: a system in the service of human flourishing and the common good, where all are valued and all have a stake, regardless of their perceived economic worth and ability. That is the heritage of our culture, the outcome of our great historic values, and emerges for me from the teaching of Jesus Christ. That’s true, isn’t it? And note that the name of Jesus is invoked in the third sentence: the fons et origo of the Archbishop’s morality and values is Christ, and he isn’t afraid to say so on the pages of the FT.
Our economic model is broken and we are failing those who will grow up into a world where the gap between the richest and poorest parts of the country is significant and destabilising. Half of all households have seen no meaningful improvement in their incomes for more than a decade. That’s all true, isn’t it? We are heaping our gargantuan debt onto the shoulders of our children and grandchildren. Where’s the intergenerational justice in that? He says the gap between the richest and poorest is “significant and destabilising”; not that it’s greater than it’s ever been, as some are reporting. And that’s true, isn’t it? Thirty years ago, when I worked in business, company chief executives were paid on average around 20 times the salary of the average worker — and people were worrying about the gap. CEO pay in the FTSE is now more than 150 times average salary. Between 2010 and 2015 alone, while many workers were seeing their pay fall in real terms, the median pay for directors in FTSE 100 companies rose 47 per cent. The seemingly runaway nature of high pay among the richest and most powerful bears little relation to the experience of the majority of people. The country must face up to the problems honestly, find the courage to confront them boldly, and act with vision and determination to seize the opportunities ahead. That’s a wise exhortation, isn’t it? The deeper question this raises is: whose economy is it? Some have argued that the results both of the EU referendum in 2016 and the general election of 2017 were in some way an expression of this question. The fundamental problem is simple: headline performance numbers do not reflect many people’s experience of the economy. Our economy is no longer working for everyone, if indeed it ever has. And for some groups of people and some parts of the country, it doesn’t seem to be working at all. In communities where I have worked in Liverpool and the north-east of England, living standards have actually fallen. What we are seeing is a profound state of economic injustice. So what are the building blocks that we need to put in place now if, by 2030, we want those young people to experience an economy that is wired for both success and justice? You see, he doesn’t just bash politicians; he offers solutions. First, we need an education and skills system that equips people for a tumultuous job market dominated by technology, and employers who are prepared to develop the skills of their employees. Second, we need a fairer tax system where those who benefit most from the economy — whether through income, wealth or investment — pay their fair share. Third, a way of using growth to decarbonise the economy, significantly reducing its dependence on fossil fuels, and look after citizens in old age. You can quibble over what he means by “pay their fair share”, but note that he’s not calling for specific or across-the-board tax rises, as many are reporting: he talks about fair taxation, which is a wholly Conservative objective, along with sound money. Decarbonisation is good and clean, but the cheapest alternative is nuclear. If you want to help the poor, we need more nuclear power plants, not more subsidised wind farms. Fourth, new ways to improve pay in both the public and private sectors; and fifth, a programme that expands the housing stock at price levels that are genuinely affordable and builds genuine, sustainable community. It’s good to “improve pay”, but reform starts in the temple, doesn’t it? If we are to focus on material wealth, how many members of the clergy struggle on their stipends? Yes, we need to build more houses so that Mrs Thatcher’s vision of a property-owning democracy might be fulfilled, but isn’t it important to balance this with environmental concerns? Or do we trample all over the greenbelt? I believe that the country must renew its values so as to face up to the problems honestly, find the courage to confront them boldly, and act with vision and determination effectively to seize the opportunities that lie ahead. That’s another wise exhortation, isn’t it? We can shape our economy through the active choices we make as a society. The incremental effect of wise and good small decisions can transform us. The next generation deserves an economy where abundance and prosperity are joined with justice. We all have a part to play, and an interest in delivering it. That’s a bit vapid but it’s all true, isn’t it? Yet don’t those “active choices we make as a society” include making the Tories the largest party in Parliament, and, of course, voting for Brexit? How else does society make choices if not at the ballot box? Jobs are being created at an unprecedented rate. Three quarters of adults are in work, the highest level since 1971, and 338,000 people joined the workforce last year, leaving 768,000 vacancies. The Institute for Fiscal Studies said the gap between rich and poor was smaller than a decade ago. Since 2007, incomes of the bottom 10 per cent had grown by nearly 8 per cent and average earnings by 4 per cent. The top 10 per cent’s income fell. The World Bank says inequality in Britain is lower than that in France, Italy, Canada or Australia. Official figures don’t back the claim that a large minority of people live in poverty. The Office for National Statistics says nearly 15 per cent of people were poor at some point between 2012 and 2015 – but fewer than 5 per cent were poor all that time, meaning those who divorce or lose a job can be thrown into poverty but rebound quickly. The ONS says that in the financial year ending in 2016 the average household income was £26,300, up in a year by £600. Accounting for inflation, this is £1,000 more than in the year before the 2008 recession. That’s not to say that anything the Archbishop has written is necessarily wrong; it is simply that we rarely hear him (or, indeed, any bishop) give thanks to God that Conservative policies have put more people into work than at any time since Harold Wilson was in No.10 and Michael Ramsay occupied the Chair of St Augustine. We don’t hear them praise the Tory progress of diminishing the gap between rich and poor. We never seem to read their FT and Guardian articles lauding Tory policies which are actively reducing inequality or strengthening the family to mitigate poverty. When do they ever wonder at the necessary creation of wealth? When do they ever acknowledge that God’s creative variety in the spectrum of people’s physical, psychological, intellectual and temperamental attributes has a bearing on their education, training, experiences and preferences, and that this might have a bearing on earning potential? The perception becomes one of anti-Conservative bias (indeed, more than mere perception); of ‘Archbishop bashes Tories’ or ‘Church of England condemns Conservatives’. It’s almost as if Conservatism is antithetical to human flourishing, and Conservatives have nothing to offer the common good. Yet under Theresa May, income inequality is at its lowest since 1986; the number of people living in absolute poverty is at a record low, and unemployment is at its lowest since 1975. No, this doesn’t amount to economic salvation, but it might just be worth acknowledging that the economy isn’t quite as ‘broken’ as it has been in former times and under previous governments. Competitive markets aren’t perfect, and capitalism isn’t flawless. It is certainly a fact that young people today aren’t likely to admire capitalism if they have no capital. How can they? Why should they? Young people (18-24) are eschewing Conservatism (and, indeed, conservatism) in their droves: according to a recent YouGov poll, 45% would vote Labour tomorrow, but only 14% would vote Conservative; and 52% believe Jeremy Corbyn would make a better prime minister than Theresa May, who scores 22%. Only 4% believe the economy to be a “most important issue”; 9% security and defence; 10% immigration and asylum. 40% believe Labour would handle taxation better than the Conservatives (on 14%); and 42% believe Labour would tackle unemployment better than the Conservatives (on 13%). A colossal 64% of this age group believe it is wrong to leave the EU (20% support Brexit). Young people are also eschewing Christianity: according to the British Social Attitudes survey, 71% say they have no religion, and 3% call themselves CofE (yes, just three per cent). Since the Church of England educates a million children and teenagers in more than 4,700 of its own schools, what is going wrong? What, indeed, might be broken? Could it possibly be that 97% of the nation’s 18-24-year-olds can discern no eternal relevance for the Archbishop of Canterbury’s social gospel, simply because Jeremy Corbyn’s is far more credible? And whose fault might that be?